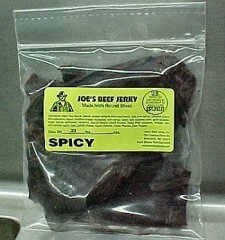 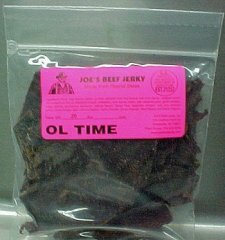 Beef, Soy Sauce, (water, protein extracts from soy beans, salt, caramel color), Worcestershire Sauce (distilled vinegar, molasses, corn syrup, water, salt, caramel color, garlic powder, sugar, anchovies, tamarind, natural flavor), Liquid Smoke, Salt, Lemon Pepper, Garlic Powder, Onion Powder, and Red Pepper. 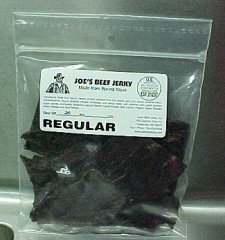 Beef, Soy Sauce, (water, protein extracts from soy beans, salt, caramel color), Worcestershire Sauce (distilled vinegar, molasses, corn syrup, water, salt, caramel color, garlic powder, sugar, anchovies, tamarind, natural flavor), Liquid Smoke, Texas Pete (peppers, vinegar, salt, and xanthan gum), Salt, Lemon Pepper, Garlic Powder, Onion Powder, Red Pepper and Black Pepper. 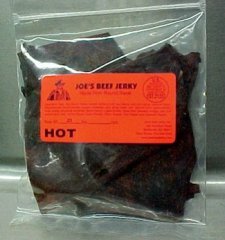 Beef, Soy Sauce, (water, protein extracts from soy beans, salt, caramel color), Worcestershire Sauce (distilled vinegar, molasses, corn syrup, water, salt, caramel color, garlic powder, sugar, anchovies, tamarind, natural flavor), Liquid Smoke, Texas Pete (peppers, vinegar, salt, and xanthan gum), Salt, Lemon Pepper, Garlic Powder, Onion Powder, Red Pepper and Cayenne Pepper.